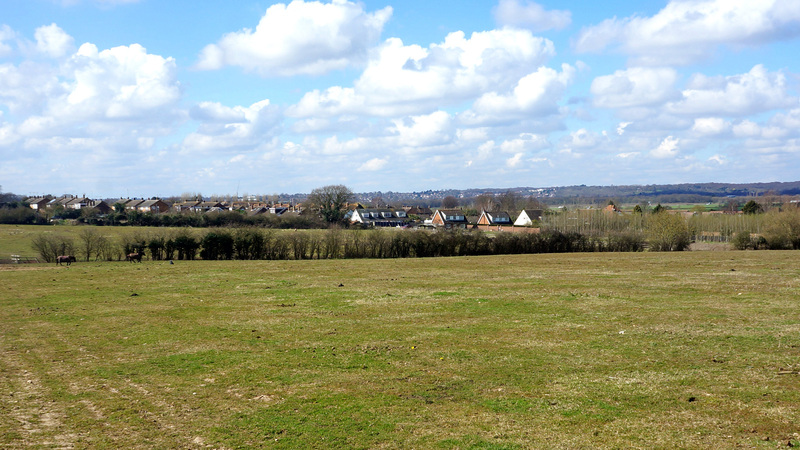 Why buy land for sale in Abridge, Romford? A rare and unique opportunity to purchase a block of valuable pasture land within the M25 and just 15 miles from Central London. 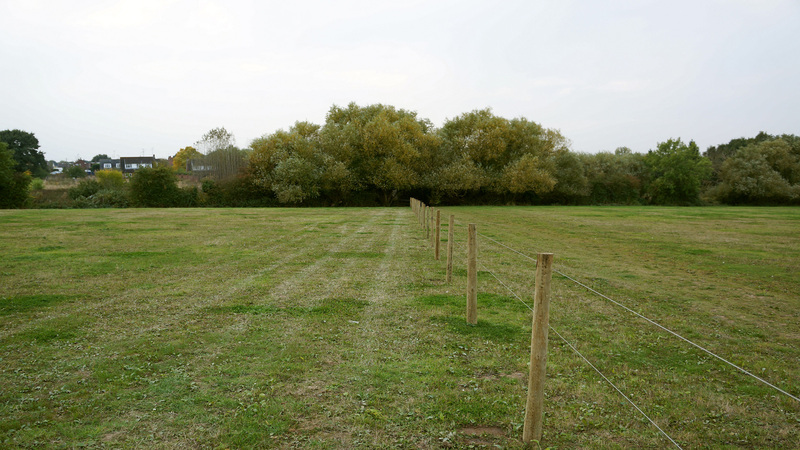 The land extends to approximately 30 acres and is suitable for paddock conversion, grazing livestock or for amenity or recreational use. 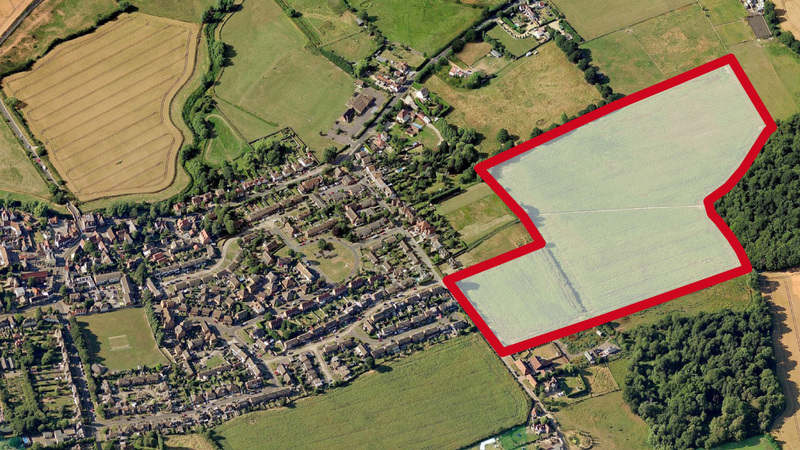 Close to dense housing, the land is considered suitable for development outside the current Green Belt policy by an independent report appointed by the Local Council. The site is located on the eastern edge of Abridge, an affluent village within the town of Romford, which enjoys extensive local amenities and excellent transport links. With Romford train station just over 5 miles from the land London can be reached in just 17 minutes. The station is also part of the new multibillion pound Crossrail programme. House prices in the area are 81% above the national average reflecting the desirability of the village as a place to own property – including land. 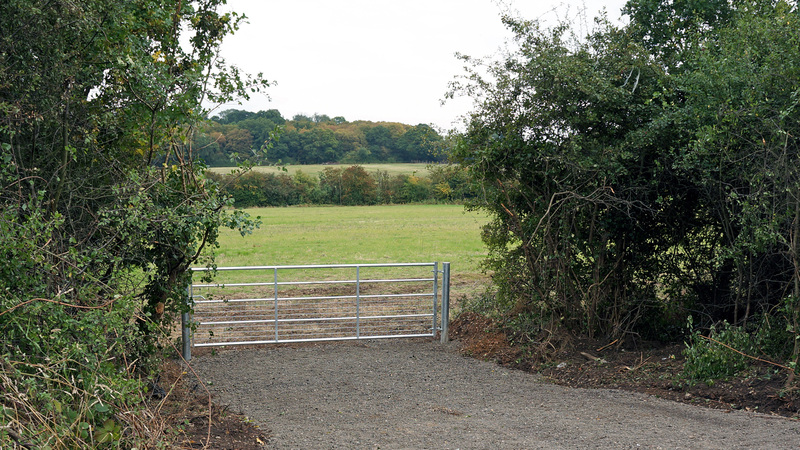 Lots 1 & 2 benefit from road frontage and their own private gated access set back from the road. Full vehicular right of way is provided to all lots via an easement (shown blue on the site plan) from another gated access within the soutern corner of Lot 2. All entrances have been improved by the current owner. 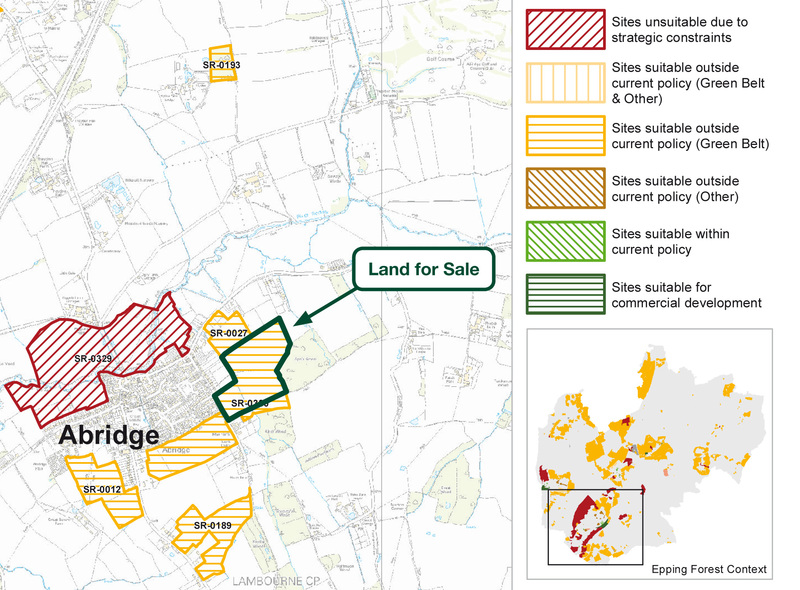 The land is considered suitable for development outside the current Green Belt policy by an independent report appointed by Epping Forest District Council. This means that if the need for development in the District is greater than can be accommodated on allocated sites, the Council will need to review its existing policies to explore whether it should review its Green Belt boundaries to allow some development. With an aging and growing population the Council must plan to meet the future development needs of the District - this means finding where to build homes, offices, shops and business premises. In September last year a report found that 11,300 new houses are needed in the district by 2033. As over 90% of the district is green belt, this has led to a major review by the local Council which could ultimately lead to the development of green belt land. The land is subject to an Overage based on 25% of any uplift in value following the grant of planning permission for development other than for agricultural, equestrian or horticultural or forestry purposes. The Overage period is 25 years from August 2016. Not looking for land for sale in Abridge, Romford? The land is situated in an affluent area where house prices in Abridge are 57% above the county average, 59% above the regional average and 81% above the national average (Zoopla). These premium house prices reflect the desirability of Abridge as a place to live and own property – including land. Abridge is an affluent village with a wonderful community atmosphere; home to local shops as well as excellent pubs and restaurants. Fashionable Chigwell, Loughton and Theydon Bois are just minutes away where you will find many exclusive boutique shops, restaurants, bars and cafes. Abridge lies within the Greater London Urban Area and the postal town of Romford. Romford is a large town in East London and is one of the major metropolitan centres identified in the London Plan. With extensive local amenities, including a vibrant nightlife, Romford is one of the largest and most significant commercial, retail, entertainment and leisure districts outside central London. Nearby Stratford is a significant retail and leisure centre in East London and has also become the second most significant (after Canary Wharf) business location in East London. The district has been a focus of regeneration for some years, including major projects such as the Westfield Shopping Centre and 2012 Olympics. The land lies inside the M25 mortorway, west of the M11, providing easy access to all the major road networks. The land is accessed via New Farm Drive, just off the A113 that links Abridge to the M11, Essex and London. The London Underground can be accessed via nearby Debden tube station on the Central line, with Romford train station – part of the new Crossrail programme – just over 5 miles away. Nearby Romford train station is part of the new cross-London railway project – Crossrail. As part of the programme Romford will benefit from significant regeneration. Crossrail will provide a high-frequency commuter service that will link parts of Berkshire and Buckinghamshire – via central London – to Essex and south-east London. The project is building 10 new stations - including a new stop at Canary Wharf, while integrating new and existing infrastructure. The new service will speed up journey times, providing easier and more direct travel opportunities to and across central London. Indeed, it will take just 27 mins from Romford to Canary Wharf using the Crossrail. As the project heads towards completion, house prices along the line continue to accelerate. House prices will, on average, increase by an extra 36% along the line by 2020. The land is crossed by a footpath, along the northern boundary of Lot 5, which forms part of the Three Forests Way. This circular walk links the site to Epping Forest, Hatfield Forest and Hainhault Forest. Hainhault Forest is the closest being just 1.7 miles south of the land. It forms part of the Hainault Forest Country Park, a 300 acre Green Flag park with spectacular views over many of London’s iconic landmarks. There is lots to do here with ancient woodlands, a fishing & boating lake, farm zoo, train rides, adventure play areas, guided walks, extensive bridleways and the recently opened nature trail. Epping Forest is London’s largest open space covering 2,476 hectares. It has something for everyone, from walking and cycling to horse riding, angling, football and golf. With its extensive network of surfaced and un-surfaced shared use trails, the forest is a wonderful place to explore on foot or with your horse. To arrange a site visit or to buy the land for sale in Abridge, Romford; please call 01727 701330 or email enquiries@vantageland.co.uk.